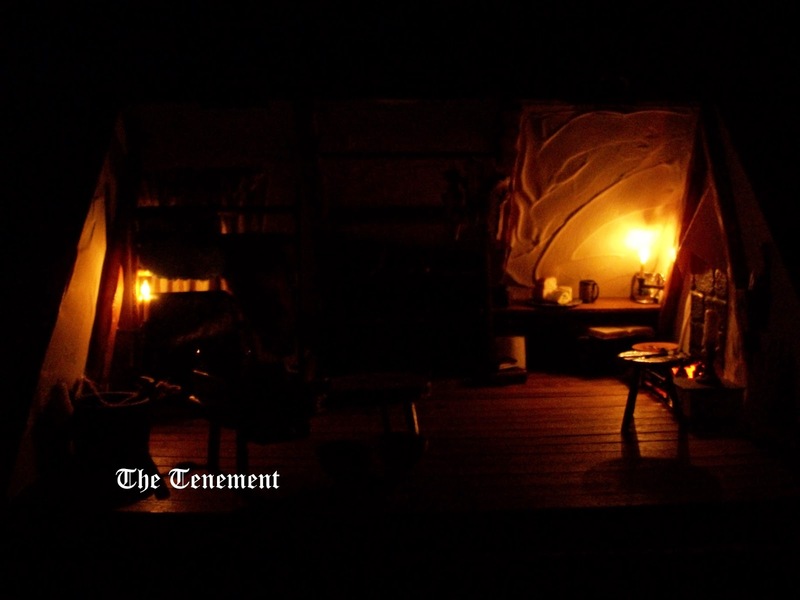 The Tenement: Mr Bennett's accommodation is ready to view. Mr Bennett's accommodation is ready to view. 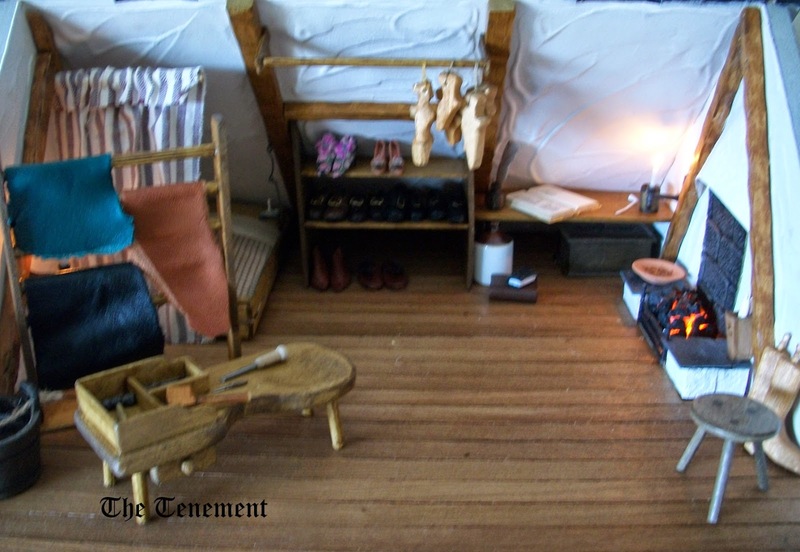 At long last and after much deliberation I've finished my Cobbler's accommodation. It took some doing, I can tell you, and a fair bit of faffing until I got to grips with this small space. 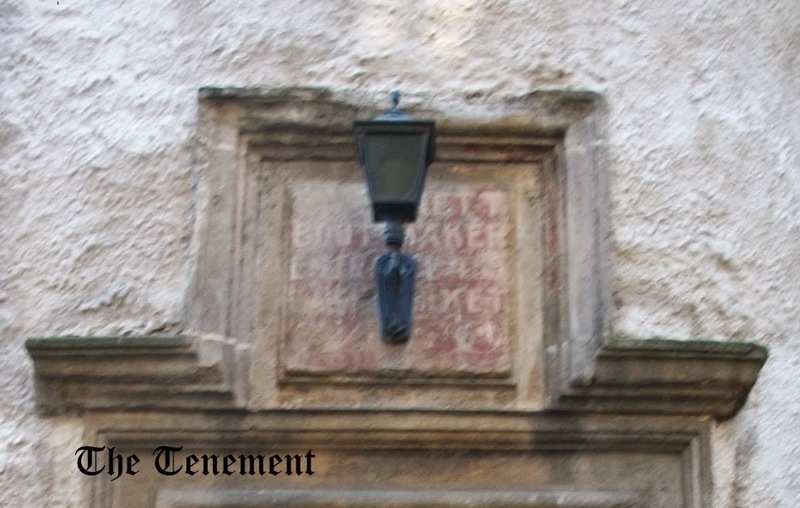 Firstly, I thought I'd show you the inscription carved into the back wall of the RL building. OK, lets visit Mr Bennett. He's out at the moment. To the left of the picture he has a bucket of water sitting in front of the rack he uses to display the leather. 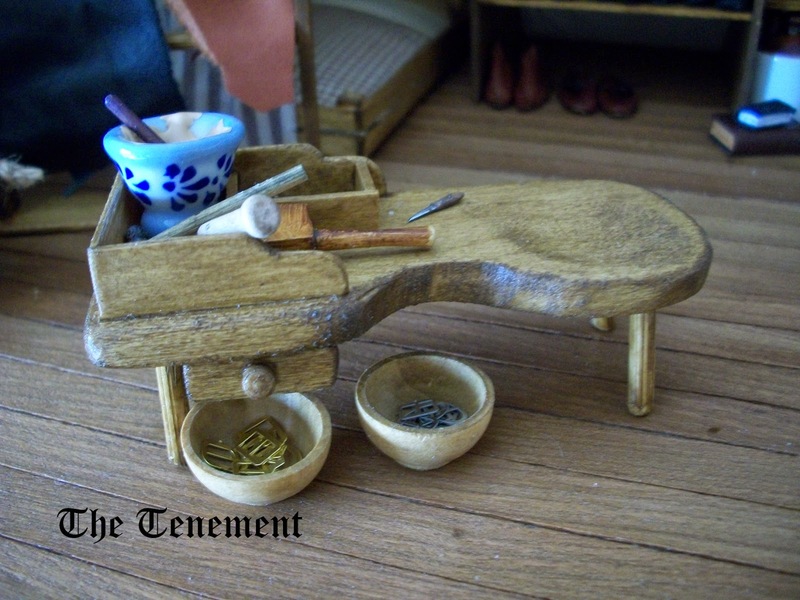 His work bench sits to the front of the rack and holds all his tools and a glue pot. 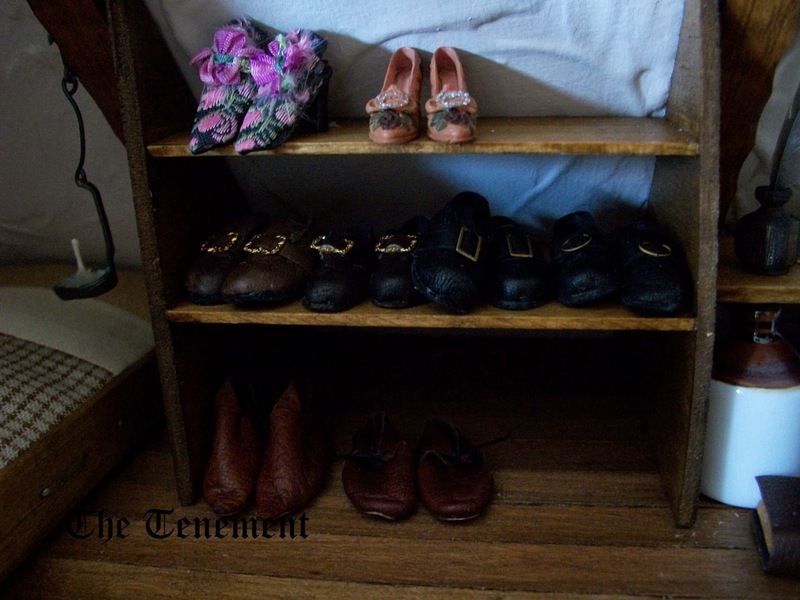 Set below are the buckles he uses for his gentlemens' shoes. 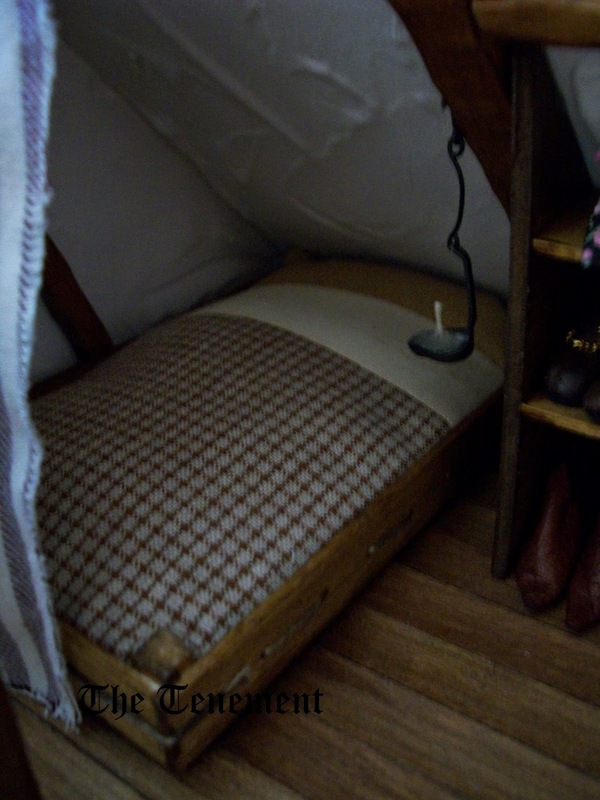 Located behind that is his little sleeping nook with truckle bed. This area is lit by a non-working cruisie lamp. When business isn't so brisk, he fills in the time by making belts. 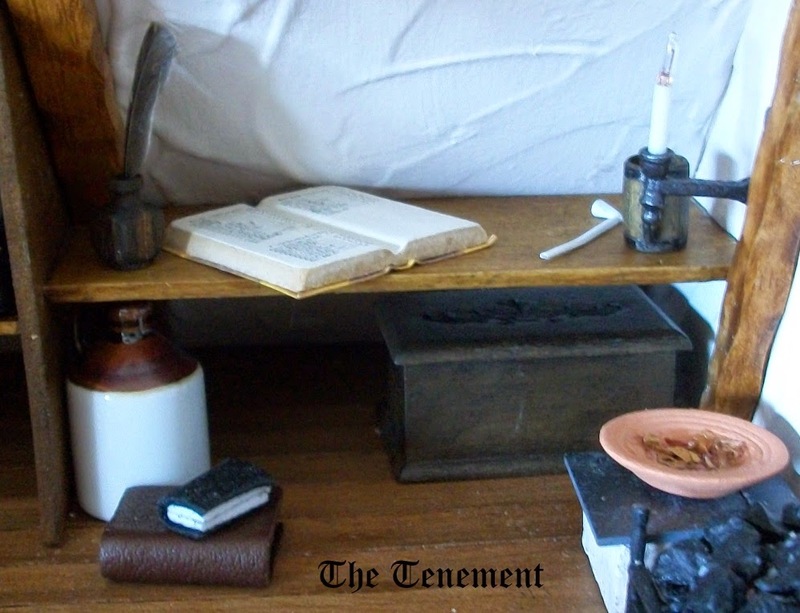 Set into the wall to the right of his display stand is the area he uses for taking orders and his order book sits there ready for the next customer along with his inkwell and quill. I like these little atmospheric shots. Irene, Mr Bennett's room was worth the wait. It is just marvellous. I love the way you have combined his work/home into a small space, just brilliant! Hi Irene! I must commend you on maximizing this small space to such great effect! The space is workable which I know has posed the greatest challenge, but you have made every inch count and nothing is forgotten or over-looked. 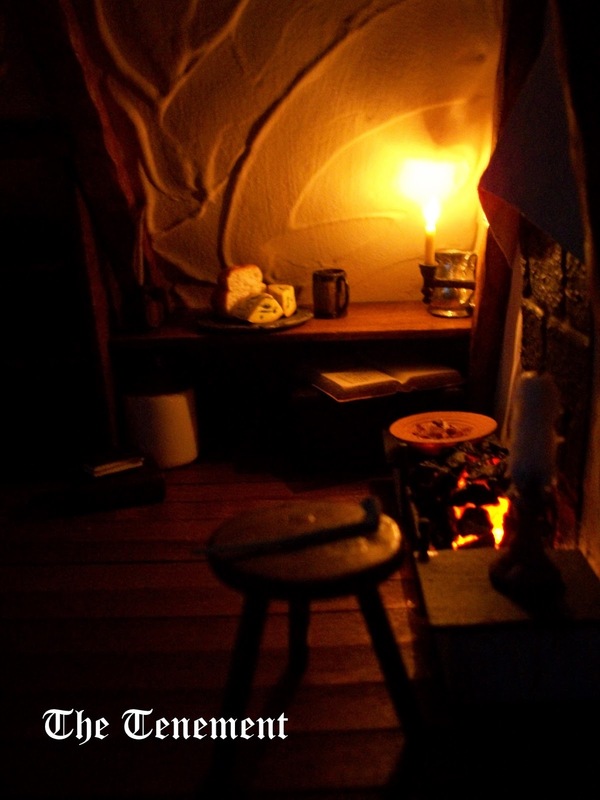 I can envision the cobbler hard at work in his tiny garret and what a cosy picture is presented with the candlelight and the coals illuminating his home and workspace. 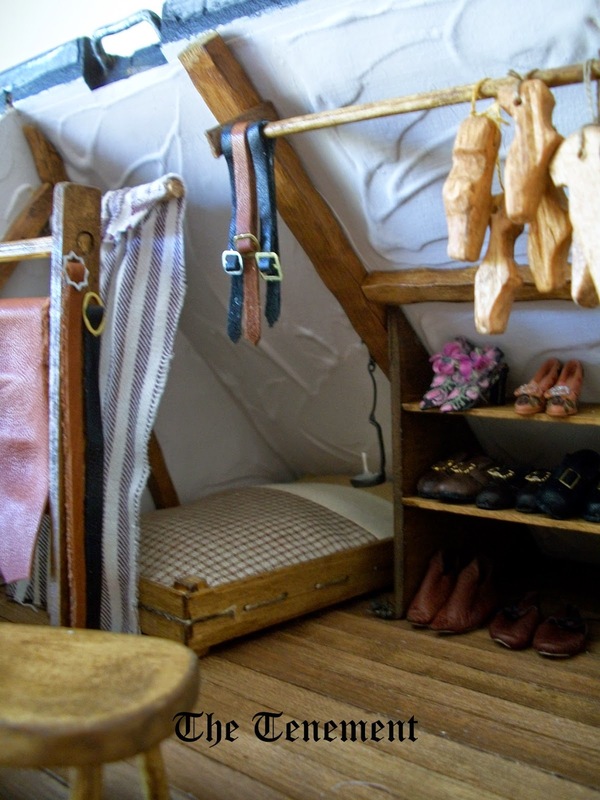 Perhaps the head of the bed should be reversed though, so that his feet are at the narrow end and the head opposite so that the poor fellow has a bit more room to breathe, but other than that I could highly recommend him, judging by the quality of all the shoes and belts that I see and by the fastidious organization of his humble establishment! Elizabeth - you did make me smile! You are absolutely correct regarding the bed and that shall be rectified before my next post. I will respond to you more fully then as I can't thank you enough for taking the time to consider my staircase dilemma. Irene, I love everything! The exterior of the RL building is so full of character. I love the nook to the side. What would it have been for? A blocked off door? And inside is just perfect - you've thought of everything! A thought regarding the rail on your stairs. You could lay a piece of paper on top of the spindles and push down gently, which would leave an imprint of the spindle ends. Then use the paper as a template to make your balustrade, drawing a line each side of the spindle imprints at equal distance from the centre. This should give you a wide curving line. Using that as a pattern, cut out a couple of layers of thin card. Gently curve them into shape to fit the stairs and then glue the layers together. You could then sand the edges even. 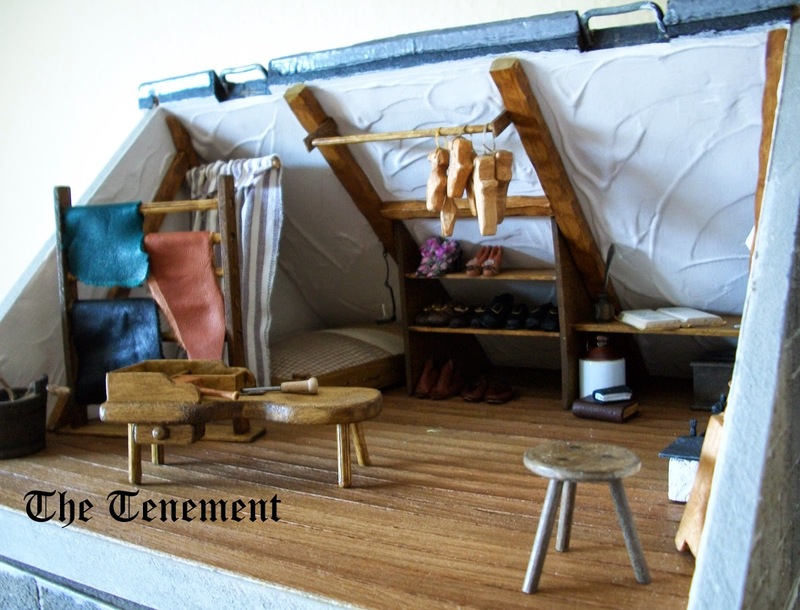 I have a recollection of someone doing something like this on one of the dollhouse forums, but not sure which. Hope things go well! Hi Irene, Another handrail option might be to use flat electrical cable that is flexible and would conform to the shape of your stairs. I believe that this is what Janine ("Minworks") used for her curved staircase. 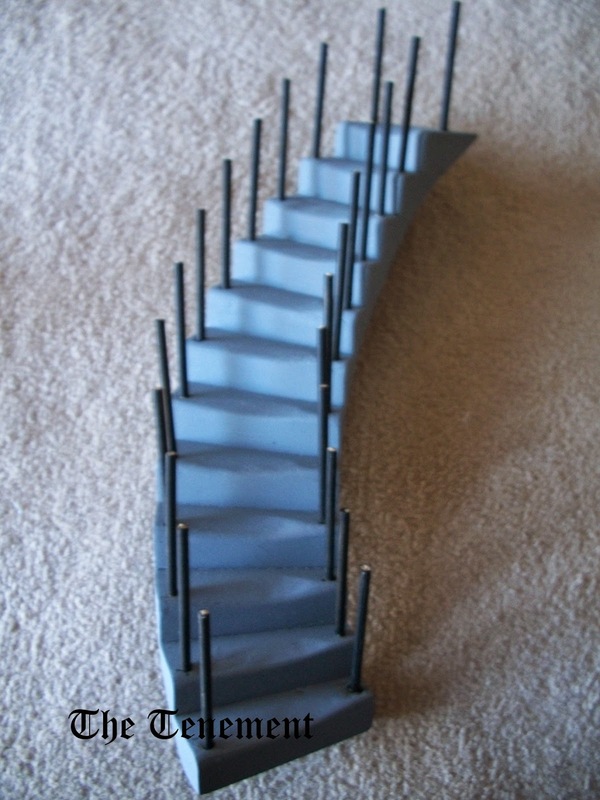 Shannon - thank you so much for taking the time to think about my staircase. I'm looking at that option as we speak and I'll let you know (next post) how I get on with it. You must be extremely proud of yourself. 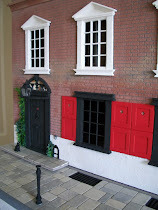 This shop is perfect and well detailed! It is just wonderful. Every detail is perfect. The space is small but you made it work beautifully. 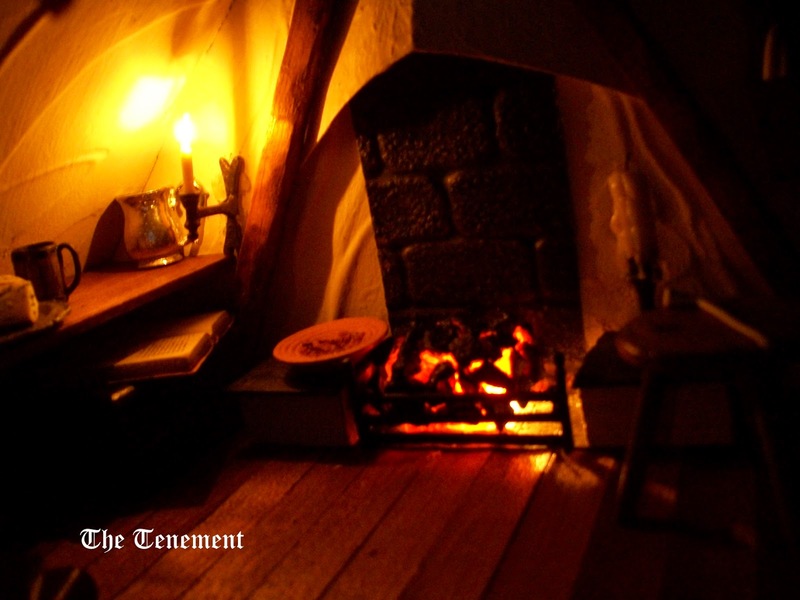 It is so cozy and I love the atmospheric shots. I adore the bed. Good luck with the handrail. You've made a wonderful room and with the light on it's fabuluous. The patience you must have to find all the accessories. Irene, this is a fantastic scene. The details have been thought about very carefully, and it is all beautifully done! A really great project! Wow, Irene, this is really very inspiring!! To see just how much can be fit into such a tiny space and still all seems uncrowded and realistic! You have thought of everything right down to the shoe buckles!!! That is what I admire so much about your work... you get the details just exactly right!!! This cobbler has quite the clientele judging by the fancy shoes on offer! The atmospheric shots are really fun too... I just love turning on the lights at night and sitting in front of my houses to admire the little worlds! Bravo for another fantastic project!!! Hi Irene, I have not heard the expression "faffing" for some time and I presume it means fiddling and not getting forward on your project? Mr. Bennett gives the impression of being a very tidy gentleman! The pictures of the evening by the fire are lovely. As Elizabeth noted, I did use electrical wire for my ballustrade - the spindles are bamboo skewers with beads added to provide some decorative element. It was quite easy to apply to the curve of the stair. I did use crazy glue I think for instant contact. Pity about my fingerprints I think they were removed with the excess crazy glue on my digits. 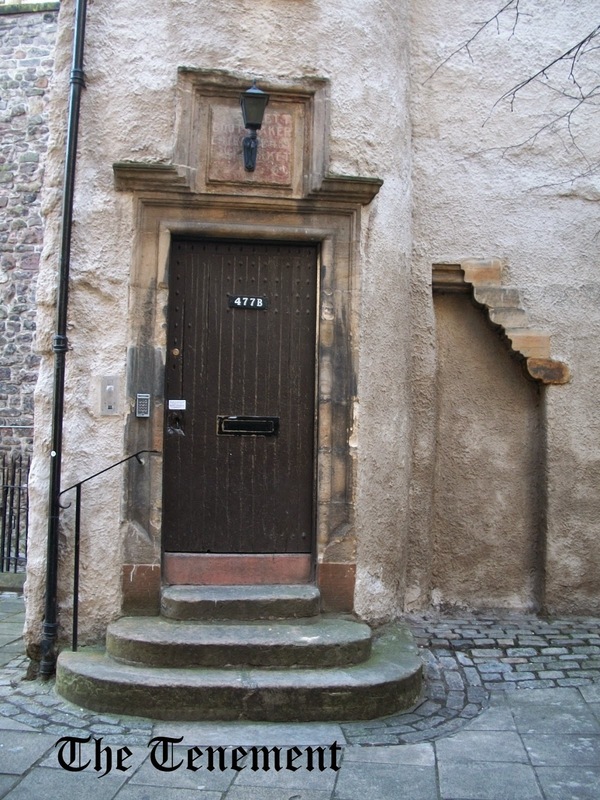 The character of your stair may require something with more body - more rustic I think I mean.